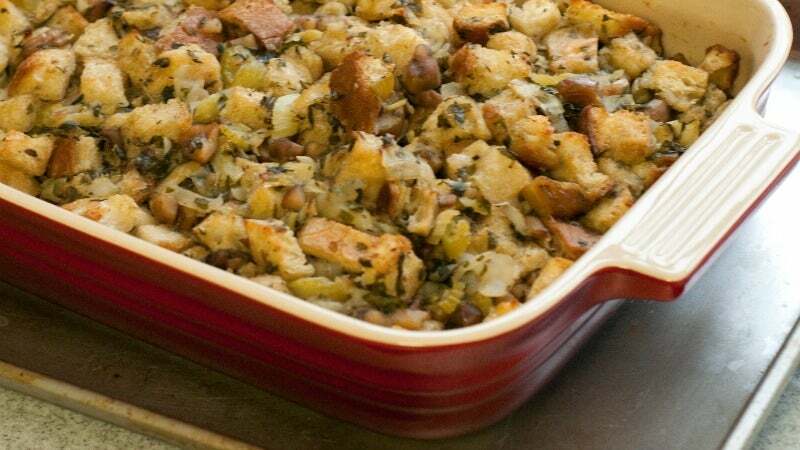 What I'm about to say may come as a shock but you should make your chicken stuffing with oven-dried, not stale, bread. Drying bread is a matter of extracting moisture through evaporation — the crumb's structure remains intact, but it becomes stiffer and crisper thanks to all that moisture loss. Staling, on the other hand, encourages the migration of moisture from swollen starch granules into airy pockets within the bread. Those starch molecules then recrystallize, yielding a texture that's tough rather than cracker-y. Worse, that moisture often stays trapped inside the bread's structure, for a loaf that's moist and stale at the same time. The result? Leathery, chewy bread. Agree completely. I always buy a loaf of fresh bread, cut in pieces and drizzle with a bit of EVOO before drying.